Former class-mass parties have responded to the steady decline of cleavage alignments in Western Europe by reshaping their appeal to increasingly de-anchored voters. Political leaders have gained center stage within their own parties as well as in voters’ reasoning, and this, in turn, has had a strong effect on the individual-level dynamics of partisan attachment and vote choice. 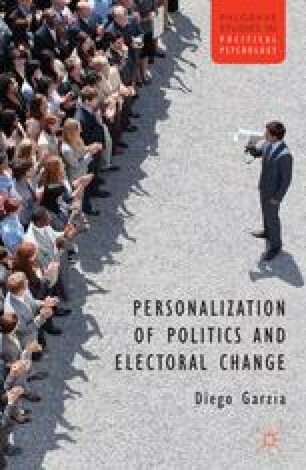 Nowadays, and in light of these developments, it can be argued that “leaders’ personalities and personal characteristics ... play a large[r] part in determining how individuals vote in democratic elections” (King, 2002b: p. 4). Indeed, the results presented so far do provide support for such an argument. Nonetheless, however valuable they may be in deepening our understanding of individual-level dynamics of voting behavior in Western Europe, these results do not tell us much about one of the most crucial aspects of the personalization of politics — namely, the impact of leaders’ personalities on the outcome of democratic elections (King, 2002a).